NETWORK UPDATE: Both the new KNOCK KNOCK LIVE and the SO YOU THINK YOU CAN DANCE clip show went up 0.1 in final numbers. In addition, the FRESH OFF THE BOAT rerun gained 0.1, but the reruns of THE FLASH and IZOMBIE lost 0.1 each. CABLE HIGHLIGHTS: Discovery’s THE DEADLIEST CATCH had the Tuesday cable win, up 0.02 to 0.86. OWN’s THE HAVES AND HAVE NOTS followed, down a steep two-tenths to 0.81. On ABCFamily, PRETTY LITTLE LIARS lost 0.05 to 0.79 (and 0.03 in the F12-34 demo to 1.89), and the somewhat inexplicably renewed STITCHERS dropped .04 to 0.23 (down 0.03 in the demo to 0.54). 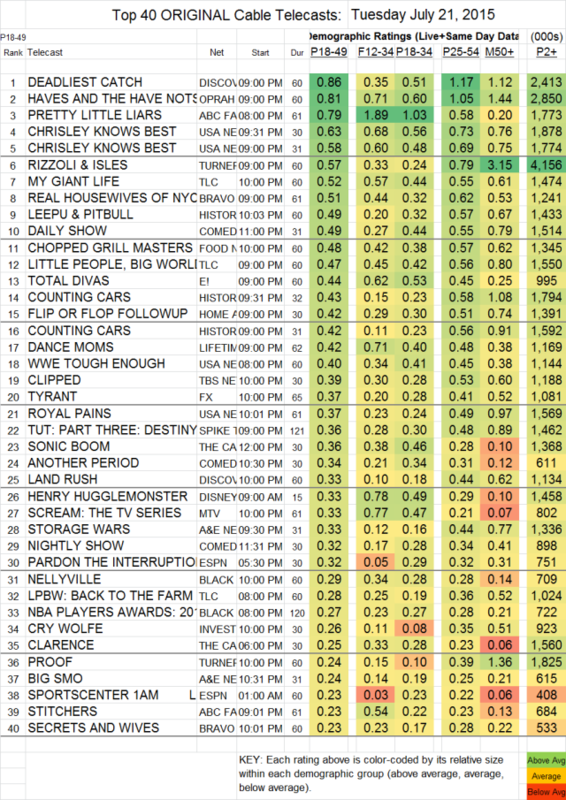 USA was led by two episodes of CHRISLEY KNOWS BEST at 0.63/0.58, up from last week’s single episode at 0.56, with lead-in WWE TOUGH ENOUGH up 0.03 to 0.40, and the ROYAL PAINS finale as lead-out, up 0.06 to 0.37. On TNT, RIZZOLI & ISLES fell 0.11 to 0.57, and PROOF dropped 0.06 to 0.24. TLC’s MY GIANT LIFE was up 0.03 to 0.52, and LITTLE PEOPLE BIG WORLD gained 0.09 to 0.47. On Bravo, REAL HOUSEWIVES OF NYC lost 0.09 to 0.51, with SECRETS & WIVES steady at 0.23. History’s LEEPU & PITBULL rose 0.11 to 0.49, but COUNTING CARS lost about a tenth, down to 0.43/0.42 from last week’s 0.53/0.50. A farewell visit from President Obama pushed THE DAILY SHOW into the day’s top 10 at 0.49, and lead-in ANOTHER PERIOD shot up 0.18 to 0.34. E!’s TOTAL DIVAS lost a tick to 0.44. DANCE MOMS (Lifetime) stayed at 0.42. On TBS, CLIPPED gained 0.07 to 0.39. FX’s TYRANT climbed 0.05 to 0.37. The concluding 2 hours of TUT (Spike) was up 0.02 from Monday’s installment to 0.36. Although we’ve seen some surprising renewals this summer, SCREAM (MTV) is moving in the wrong direction, down 0.06 to 0.33 in 18-49s and down 0.02 in F12-34s to 0.77. On A&E, STORAGE WARS was at 0.33, and BIG SMO was at 0.24/0.20. AN IDIOT ABROAD (Travel) was at 0.08/189K. BIG BROTHER AFTER DARK (POP) was at 0.04/93K.